Takeaway: Combining traditional and online instruction is the best approach to EHS training. There is some debate over whether eLearning or a more traditional instructional approach is best for health and safety training. As with most things, they work best when used together to achieve the same training objective. According to Kineo, a global company in skills education, today's employees prefer eLearning's fast-paced environment and easy online access. Some of the additional benefits include faster delivery of materials, lower costs, and lower environmental impact. To make a case for whether eLearning is really more effective, however, we have to consider another important factor: how people learn. How People Learn is the title of an educational psychology book edited by John D. Bransford, Ann L. Brown, and Rodney R. Cocking. One of the conclusions reached in the book is that assessment and feedback are crucial for helping people learn. Classroom environments, then, and the experience of students in them can be positively influenced by opportunities to interact with others. It is that human element of interaction that is highlighted by SafetySkills, an American developer of high-end, competency-based, custom-built e-learning courses for environmental health & safety and human resources education. Blending traditional and online instruction gives the best of both worlds: face-to-face learning with an instructor and peers along with the online tools that supply the ingredients required to verify competence with the material and measure the understanding of that material. And that evaluative element, supplied by the online component, is crucial. "It’s widely understood that with safety training, it’s not enough to show that an employee has been trained," says SafetySkills. "Showing that the learner was able to parrot back information in the form of a multiple choice test is not sufficient, though this approach is common in corporate and industrial training programs. Ideally, employees must demonstrate that they actually learned and achieved competency in performing the job safely." eLearning not only provides the content with quick delivery, but also allows the users to interact with the material in a way that takes advantage of the three ways we learn. By the use of text, audio narration, and animation and illustration, online modules cater to our cognitive, auditory, and visual modes of learning. But it's the human element that conveys the importance of the material, that makes it more than just a few facts to memorize and forget, more than a box to tick. When learning about the importance of wearing certain safety equipment, employees might see photographs and read some facts, but in the classroom there will be facial expressions, tone of voice, and physical presence that convey the seriousness of the topic (see 6 Personal Protective Equipment Guidelines Every Employee Should Know to learn more about the basics of PPE). Add to that the interest of personal stories and testimonials, and the learning environment becomes more dynamic, increasing the likelihood of learning and retention of material as it is presented. Training objectives involving compliance with regulations for occupational health and safety need this added insurance that employees will not just learn the concepts, but that they could become lifelong learners, trained to always be looking for ways to improve the work environment and to make safety suggestions to management promptly (learn about the importance of employee feedback in Implementing a Safety Culture: Speak Up for Safety). Employees almost always roll their eyes at safety training, says SafetySkills, so the follow-up on these training sessions is critical. An effective training program must establish direct links between identified hazards and how important it is that employees develop competencies required to mitigate them. Again, it is the human element of the training program, presented in a way that allows for feedback and discussion among those being trained, that makes occupational health and safety not just a list of rules to be observed, but a company culture to be embraced. Another critical element of the traditional training environment is that it provides a hands-on approach to instructions that may be brand new to the employee and difficult to implement in eLearning module. Learning how to operate machinery safely; put on safety equipment such as a safety harness or hard hat; or having the experience, with a teacher observing, of properly putting on and removing a respirator gives a tactile dynamic to the training that could save life and limb. "The more parts of your brain you use, the more likely you are to retain information," says Judy Dodge, author of 25 Quick Formative Assessments for a Differentiated Classroom. "If you're only listening, you're only activating one part of the brain," she adds, "but if you're drawing and explaining to a peer, then you're making connections in the brain." It is this tactile, hands-on multitasking in the live instructional setting—especially when it comes to machinery that will need to be used safely or personal protective equipment that needs to be properly fitted to the body—that increases understand and retention of material through the "busy hands, busy brain" phenomenon. Recent research has even shown that people who doodle during business meetings have better memory recall. And just think of how much more important this memory recall is when it comes to EHS training sessions, where so much more is at stake. But what about the cost savings that eLearning programs deliver? It's not uncommon for a company to save as much as 80 percent in direct costs by supplanting their conventional training approaches with online safety training, says SafetySkills. Certainly the delivery of the training programs online speeds up the process for those who can study and be tested at a pace that matches their personal learning speed and style. Others needing more time to consider their answers can go slower without holding up the entire class. Drive time, bathroom breaks, and other elements of the traditional classroom and on-site are also minimized with eLearning, but employees can't ask questions or share ideas. 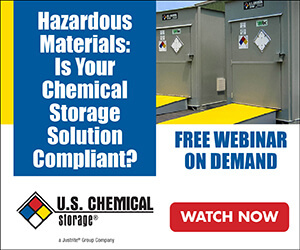 Courses in hazardous materials management that are designed to satisfy the training requirements of applicable OSHA, EPA, and DOT regulations can be customized with eLearning tools so that employees who have been on the job for longer periods can take only the shorter refresher training and not sit through the entire overview needed for new employees. Changes in both mandatory regulation and company policy can also be made quickly in an online course, sometimes instantly. This is particularly helpful when a big portion of the workforce is "out in the field" and the course can be taken on a laptop, tablet, or even a smartphone. To put it simply, there is no clean and easy answer when it comes to the debate between traditional instruction and eLearning. The best and most effective safety training happens when companies bring both approaches into one environment. The blended approach provides increased efficiency and convenience that will keep the company from wasting resources while also improving retention and conveying the seriousness of the training material to ensure that the training "sticks" and leads to reduced workplace safety incidents (for advice on delivering effective, in-person training, see 7 Superb Psychological Tactics for EHS Training). While it's tempting to either stick with the old way of doing things or throw it out of the window completely to move everything online and save on costs, combining both is the best way to get the most out of your safety training program. Justin has been the marketing director at SafetySkills since 2016. Established in 1993, SafetySkills has developed over 450 EHS online training titles.